By Brian Horais, submitted November 30th, 2003. Are you a proud owner of an FJR1300 with a Yamaha/Corbin seat and feel like the seat just doesn't quite match your ergonomics? Is the "cup" of the seat just a little too far back for your tastes? If so, read on. There is hope. I added the Genmar barbacks first to my FJR to improve the reach and then purchased the Corbin seat a few months later. The Yamaha/Corbin seat is a big improvement over the stock Yamaha seat (which isn't all that bad for a stock seat), but it wasn't as good a fit as I wanted it to be. I found that my ergonomic fit with the FJR Corbin wasn't as good as I experienced with the Corbin I had on my BMW R1100GS. The "cup" or back lip of the FJR seat was just about an inch too far back. I'm 5 ft 11 inches tall with a 32/33 inch reach. Not willing to accept the status quo, I took a look at the construction of the seat and decided it was time for a "foam-ectomy". The first step is to address any deep-rooted concerns that you are going to ruin a very nice seat. Don't worry, if you know how to handle a drill and a pop-rivet tool, the job is pretty straightforward. My principal objective was to add about an inch of foam behind the seat "cup" (the part that cups your rear end under heavy acceleration...). I reasoned that I could remove the rear portion of the seat, make a cut in the existing foam, insert some additional foam and then button it back up before the patient expired (woops, too much time watching ER...). Taking a look at the bottom of the seat you can see that the seat cover is held on by pop-rivets. These are easy to remove. All you have to do is to drill out the center part of the pop-rivet with a drill bit that is slightly larger that the pop-rivet's center shaft. I used a 9/64 bit. The pop-rivets are aluminum, so it is relatively easy to drill them out. Once the flat, washer-like part of the pop-rivet comes off you can move on to the next rivet. I removed all of the pop-rivets from about halfway back on the seat, leaving the front of the seat unmodified. This allowed me to fold the seat cover forward enough to access the seat-cup foam edge. 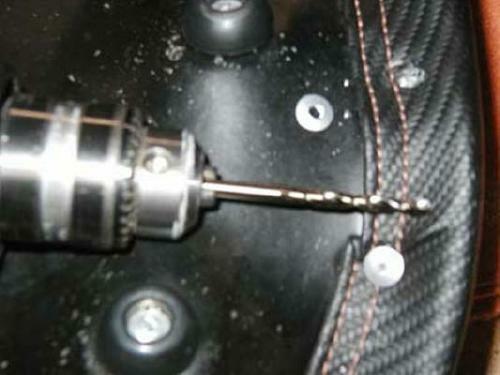 Once all of the pop rivets are drilled out, you need to drill the embedded part of the pop-rivets out of the hole. Be careful here, if you put too much pressure on the drill it may go all the way through the foam and seat cover before you know it. [No, I didn't make this mistake...] This is a good time to prepare the holes in the seat pan frame so they will be ready for the pop-rivets. I enlarged the holes to 3/16 inch and used an extended length 3/16 pop rivet (4 mm long) with a flat washer for the re-installation (discussed later). Heres a view of the drill and the first pop rivet I removed. Once the pop rivets were removed, I folded the seat cover forward and marked a line about one inch 1 inch aft (Navy terminology) of the seat cup lip (see the picture) for my cut line. Using an exacto knife for the initial cut, I continued the cut down to the seat backframe using a saw blade that fits on an exacto knife. The deep cut will allow you to insert enough foam behind the seat cup. When cut was completed and all of the loose "crumbs" were cleaned out (just use your finger to brush them out), I cut two long pieces of foam for insertion. I used a fairly firm foam from a Coleman sleeping bag pad (cost $6.99). Don't worry about getting an exact fit on the upper edge of the foam. You should "feather" the square vertical edges at each end of the foam to ensure a smooth insertion line when you are done. I used two layers of the Coleman sleeping pad foam (green). 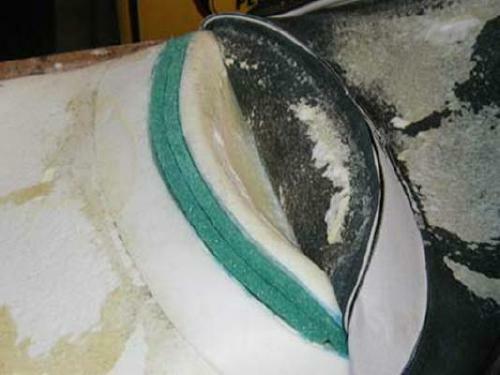 The picture below shows three layers of the foam. Because the third layer was distorting the seat lip edge, I decided to go with two layers. This picture was taken before I trimmed or "feathered" the vertical edges of the foam. Step back to admire your work - the foam portion of the "foam-ectomy" is done. 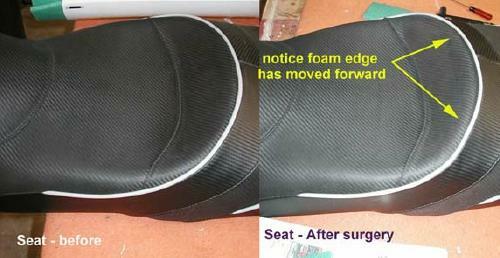 Now all you have to do is to re-glue the seat cover on the foam and re-insert all of the pop-rivets. 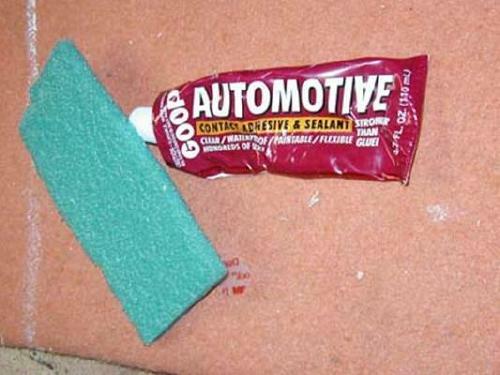 To re-glue the leather portions of the seat cover, I used "Automotive Goop" (see picture), a gel-like contact glue that is available in most auto parts stores. 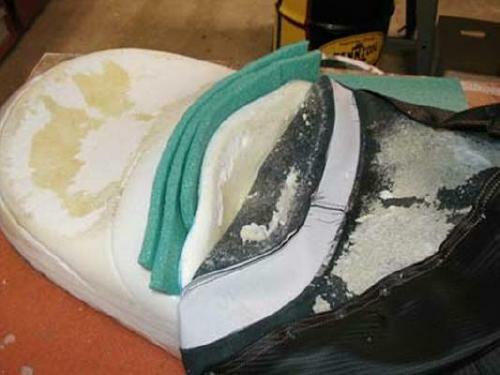 Make sure the glue you use will not eat-away the seat foam. You can get a better look at the Coleman sleeping bag pad foam (green) in this picture. Let the glue dry for the required amount of time (24 hours for the automotive goop) and then you are ready to re-insert pop-rivets. I alternated installing two pop rivets on each side, starting at the forward-most point, to make sure I was stretching the seat cover evenly. The pop-rivets at the end of the seat should be installed last. Take your time stretching the cover and reinserting the pop-rivets. 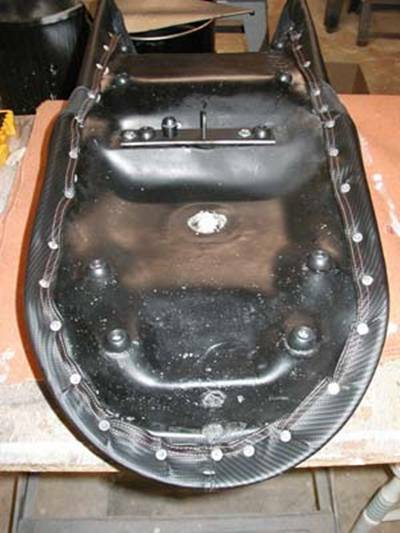 Remember that you have added about 1 inch of foam, so it will be a little tighter making the holes in the seat cover line up with the seat pan holes. Once the pop-rivets are re-installed, turn the seat over and admire your handywork. Better yet, put the seat back on the bike and give it the real test. 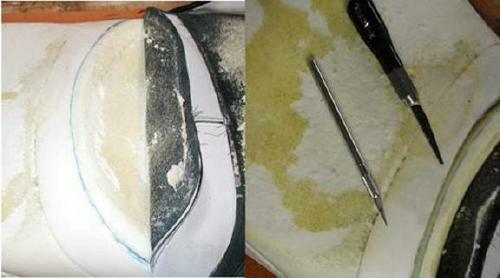 Here's the before and after pictures of the seat. It doesn't appear dramatic in the pictures, but the results are definitely noticeable. I found that my "foam-ectomy" moved the seat cup lip forward just enough. Now it provides excellent support under acceleration and normal riding. The surgery was a success! Copyright © 2003, by Brian Horais and H. Marc Lewis. All rights reserved.